Mr. Baity, an Iredell County native, has over 22 years experience practicing criminal law and is considered a leader among his peers. Mr. Baity has received the 10 Best 2018 & 2017 Client Satisfaction recognition from the American Institute of Criminal Law Attorneys. Mr. Baity is a 2016, 2017 and 2018 member of The National Trial Lawyers Top 100 Trial Lawyers. In 2018, Mr. Baity was awarded 10 Best Attorneys as published by American Institute of DUI/DWI Attorneys. He holds a B.S. in Education and an MBA in International Business from Johnson & Wales University in Providence, Rhode Island. Mr. Baity earned his Juris Doctor degree from The Western Michigan University Thomas M. Cooley Law School. Mr. Baity is the 2012-2013 Past President of the 22A Judicial District Bar, which encompasses Iredell and Alexander Counties. Mr. Baity was appointed to serve on the 2014-2015 Local Bar Services Committee by the North Carolina Bar Association President Catharine B. Arrowood. He served as Vice-President of the 22A Judicial District Bar in 2011-2012. Mr. Baity is a member of the North Carolina State Bar, the North Carolina Bar Association, the American Bar Association, the Iredell County Bar Association. Mr. Baity currently serves on the 22A Judicial District Criminal Courts Committee as well as the jail facility task force to determine the needs of the Iredell County Jail. He is admitted to practice in State and Federal Court. As a trial attorney, Mr. Baity commands attention in the courtroom. He has successfully handled numerous trials in Superior Court and regularly does trials in District Court. Mr. Baity is certainly no stranger in Administrative court. In fact, he has handled many thousands of traffic cases in Administrative court over the past 22 years. Mr. Baity's experience in State and Federal Court gives you the assurance that he will handle your case with confidence, competence and personal attention to detail. He understands the stress that individuals go through when involved in the judicial system. 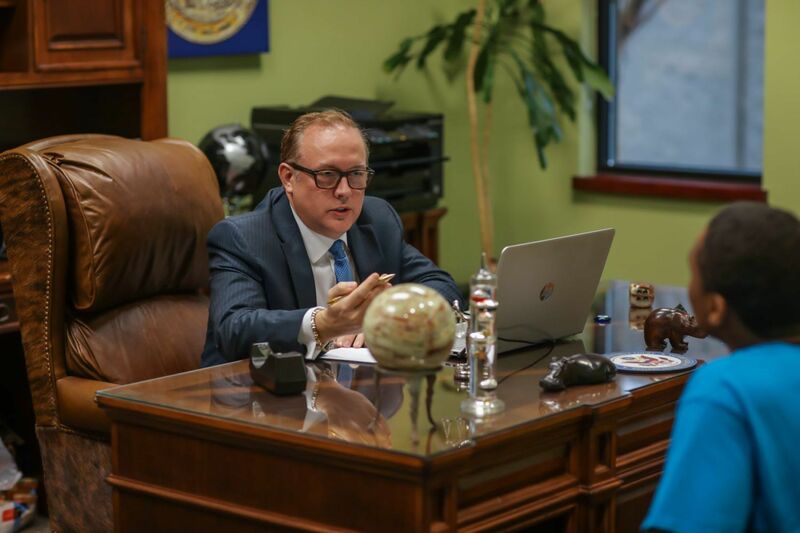 Mr. Baity will make every effort to put you at ease by explaining the various processes to you and by keeping you informed as needed along the way until your case is successfully resolved. Mr. Baity has a strong commitment to the community and believes in giving back. Over the years, Mr. Baity has sponsored numerous youth sports teams. Mr. Baity has served as a board member with the City of Progress Kiwanis Club, the Iredell County Emergency Children's Shelter, and the Elder Center. Mr. Baity is a charter member of the Rotary Club of Troutman. He served as Club President in 2014-2015. Prior to that, Mr. Baity was Vice President and Foundation Chair. Mr. Baity enjoys teaching and has taught paralegal courses as adjunct faculty at Mitchell Community College in Statesville, NC and the Rowan-Cabarrus Community College in Salisbury, NC. AT BAITY LAW, WE HAVE AN EXCEPTIONAL SUPPORT STAFF. ADMITTEDLY, WE MIGHT BE A LITTLE BIASED, BUT ACCURATE NONETHELESS. Melynn B. Cairo is our administrative and legal assistant in criminal, traffic, wills, and uncontested divorce matters. Melynn is a graduate of The University of North Carolina at Chapel Hill with a B.A. in Sociology and a M.A. in Human Services Counseling Addiction and Recovery from Liberty University. Melynn is a team player who understands that no matter the type of case, it is a serious case to you and she is committed to assuring that you have a positive experience with the office staff and the outcome of your case. Matthew comes to us from NC Probation and Parole. He has a Bachelor's degree in Criminal Justice from Lees-McRae College. Matthew is committed to providing excellent client services in criminal law, traffic, wills, and uncontested divorce matters. Meredith Cairo is our summer legal assistant. Meredith is a 2017 graduate of Wake Forest University with a major in Psychology and a minor in Anthropology. She is currently a 2L in law school at Campbell University in Raleigh. When interning, Meredith assists Mr. Baity in the areas of criminal law, traffic, wills, and uncontested divorce matters.